Yes folks, Santa is Back and he’s been keeping a list all year long about who’s doing right and who’s doing wrong. You’d better watch out he’s got his eye on you and he has those little green spies watching all you do. A fun novelty seasonal song. 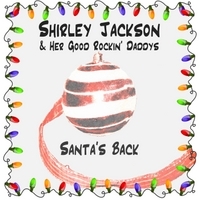 Santa is Back this year with Shirley Jackson & Her Good Rockin’ Daddys he has brought along the new release CD’ When The Money’s All Gone’, a special blend of 13 tracks including seven originals by Jackson ranging from raunchy guitar, soulful horns and bluesy ballads. While working on recording "When The Money's All Gone', Shirley and the GRD's had the opportunity to begin Christmas in July. The Santa’s Back single is a result of those recording sessions.